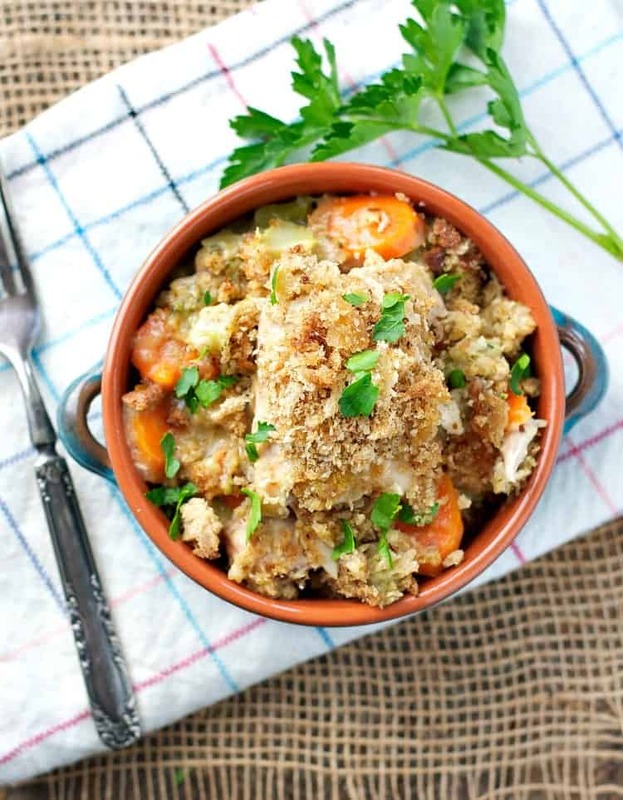 Creamy and comforting chicken and stuffing casserole made in the slow cooker. This low prep casserole is bursting with flavor and is the perfect way warm up on a chilly winter evening. 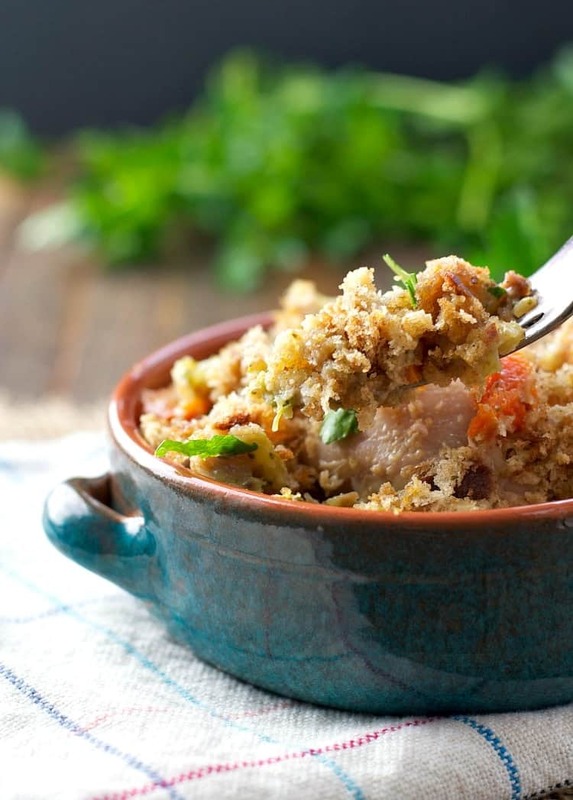 This is the time of year for comfort food, and nothing beats a classic Slow Cooker Chicken and Stuffing Casserole for an easy dinner. With carrots, broccoli, chicken and stuffing all cooked in a creamy sauce, it’s a true one pot meal that warms our bodies, nourishes our souls, and takes the chill off of these cold nights! 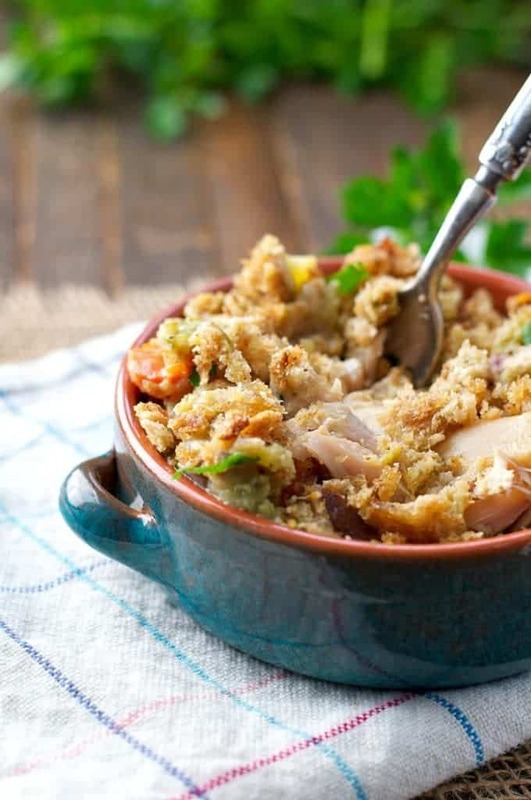 One of the most popular recipes on this blog continues to be a recipe for Chicken and Stuffing Casserole that I shared back in 2013! The recipe is one that I received on an index card at my bridal shower from one of my mother-in-law’s friends. It also reminds me of a dish that my own mom made regularly during the cool weather months of my childhood. Long story short, this is a classic combination for a reason: it’s delicious, it’s easy, and it appeals to just about everyone! While the original is still a keeper, sometimes I just need a dump-and-go slow cooker chicken recipe that doesn’t require my attention…at all. The kind of meal where I can toss the ingredients into a pot, set the timer, and then forget about it for the rest of the day. I don’t want to dwell on my dinner, stress about what to serve, or spend hours slaving over a hot stove. Set-it-and-forget-it is definitely the way to go! I adapted Lois’s recipe to make use of the Crock Pot and added some veggies so that it would be a complete dinner — no sides necessary! 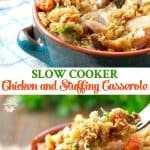 This Slow Cooker Chicken and Stuffing Casserole is comfort food at its finest, and an easy weeknight dinner that every home cook should have in her repertoire. I hope that you enjoy it as much as our family does! You can use a cooked rotisserie chicken or purchase cooked chicken at the grocery store for a shortcut. Want to Prep Ahead? 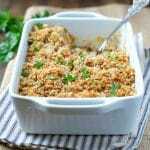 This casserole freezes well, so if you want to make it in advance, just continue through step 5 putting everything into a freezer-proof container, wrap tightly, and place in freezer. When ready to eat, defrost and continue with Step 5. Place carrots and broccoli at the bottom of the prepared slow cooker. Season chicken with salt and pepper and place on top of the vegetables. In a medium bowl, whisk together condensed mushroom soup, condensed chicken soup, and water. Pour sauce over the chicken. Sprinkle dry stuffing mix over top of the chicken. Drizzle with melted butter. Put a lid on the slow cooker and cook on LOW heat for 6-8 hours (or on HIGH for 3-4 hours). That’s so neat that you live in an old farmhouse! I bet it has its charms! This casserole is my definitely of true comfort food. There’s nothing better than making a meal in the slow cooker, especially when it involves a classic like this. And I love how easy it is, too! I’ve got to try this! Thanks, Gayle! Yep, the farmhouse has TONS of “charm” — but it’s also a lot of constant maintenance and upkeep. We do love it, though. I don’t have time to do this in the slow cooker. Can I bake this in the oven and if so for how long? You can add some veggies to that casserole as well, if you want to throw in some peas, broccoli, etc. Enjoy! I see that one of the tips says to use rotisserie or cooked chicken….how much cooking time gets knocked off off of the total cook time since the chicken is already done cooking? Hi, Connie! You’ll still want to cook for about the full amount of time, or else you’ll end up with raw veggies. 🙂 Every slow cooker is different, so keep an eye on your dish. You’ll know it’s done when everything is nice and tender and cooked to your liking! I agree with Gayle, your farmhouse sounds really charming. Old wood stove and tea… comon.. that’s so cozy 🙂 Love the story behind this lovely casserole. Once again you’ve showed us just how amazing cook you are. This looks delicious. Oh, you are so sweet Natalie. Thank you!!! holy moly! 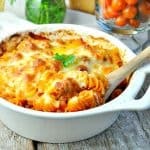 way to adapt a comfort food to make veggie packed and slow cooked to perfection! You got mad mom skills and chef skills! you know that, right? Hah! I wouldn’t survive without my slow cooker (as you know), and I wouldn’t get nearly enough veggies in their bodies if I didn’t combine them with other good stuff! This morn made your slow cooker italian chicken & quinoa soup. Just had bowl-so good! Will be making again! Am new to your website-easy pleasing recipes! Thnx! Hi, Cindy! That’s wonderful! 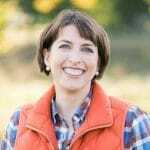 So glad that you enjoyed the soup, and welcome to the blog. I hope that you find plenty of other delicious meals to enjoy too! Jesse would happily (and does, on Thanksgiving) just eat the stuffing and not whatever it was stuffed inside of so he would LOVE this! On Thanksgiving we make two batches of stuffing – one for the turkey and one to bake by itself for Jesse, haha! What size slow cooker please? Hi, Donald! I used a large 6-quart slow cooker, but anything in that general size range will work! 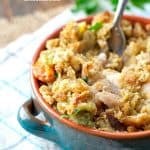 This chix stuffing casserole is amazing! I’m making it for the second time in 4 weeks! Can you use a bag of frozen cut green beans and set of the broccoli? 5 stars! Loved this recipe! I am not used to having broccoli and carrots though in my dressing, are they needed? Awesome, Melissa! I’m so glad that you’ve enjoyed this recipe — and thanks for the tip about the Kroger brand stuffing! Do you start w/ raw chicken? Do you dice it first? 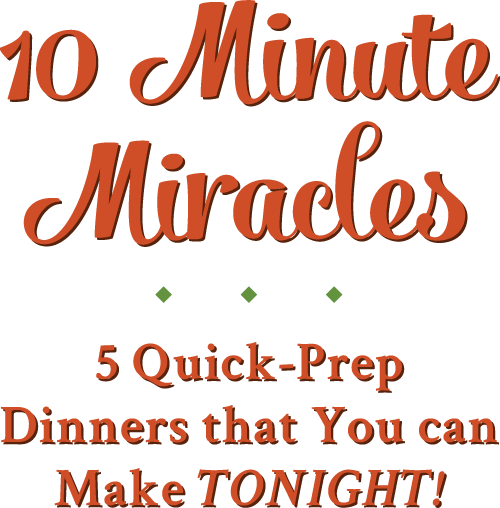 This did sound comforting and I really wanted to try this recipe and started to pin it…when I saw the sodium levels per servings! Yikes! That’s a heart attack waiting to happen. Must be the canned soups. Good question above about dicing the chicken first? I totally understand if it’s too much sodium for your liking; however, if you don’t have heart problems or high blood pressure, one dinner with higher-than-ideal sodium every now and then shouldn’t hurt you at all. 🙂 It’s all about balance! I am making this tomorrow. I have sodium issues. I am using Campbell’s healthy request. It has lower sodium. You could use any other lower sodium cream soup. Could I use sliced butternut squash instead of or in addition to carrots? Can you freeze or refrigerate left overs and reheat in microwave? I’ll be alone on thanksgiving and this sounds like a good meal for me instead of turkey. Hi, Rosemary! Yes, I think the butternut squash would probably work well as a substitute! 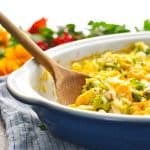 A lot of folks have added vegetables to that casserole with good results. You could use the butternut squash in it as well, but I would suggest pre-cooking or steaming it a bit so that it’s soft enough when the casserole is done baking. The casserole freezes really well before it’s baked, so I would divide the recipe between two smaller (8-inch square) pans. You can bake one right away for your meal, and then wrap the other one tightly and freeze it for your Thanksgiving meal. Then just thaw overnight in the fridge and bake on Thanksgiving! 🙂 Hope that helps! Sounds great for a Thanksgiving side! I only have a 3qt pot at moment (graduating to larger soon!). How much adjusting do you think I’d need for this recipe? Awesome! I hope that you loved it, Jess! 🙂 Merry Christmas to YOU! Can i use baby carrots instead of sliced ones? 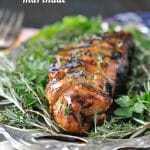 This is an AWESOME recipe, This will be something i cook for years to come! I dont add the carrots, this time i didnt have broccoli but had broccoli cauliflower mix, came out fine, I also had Kroger Chicken Stuffing instead of Pepperidge Farm , i use it all the time now instead. Hi was wondering if you could use fresh broccoli instead of frozen and if so how would i incorporate them into it time wise ? btw recipe looks fantastic !! Sure! Fresh broccoli will work too, Stephanie! The cooking time will not be too different in this case for the fresh vs. frozen broccoli. The broccoli definitely gets soft during the slow cooking process, either way. If you like it less soft, I would add it to the top of the veggies (with the chicken). Hope that helps, and enjoy! Can I use 2 boxes of stuffing for this recipe? Can I use Stove Top stuffing instead? Can I use thin sliced chicken breasts? This sounds like something I could make very easily! Gonna try it with frozen cut green beans, since I can’t eat broccoli. Hi, Randi! I’m not as familiar with Stove Top stuffing. If it’s the same consistency (when dry) as the Pepperidge Farm, then yes — you should be able to substitute with that. The thin sliced chicken breasts would cook MUCH faster in the Crock Pot, which means that your vegetables probably won’t have time to cook through all of the way. If you’re going to use the thin chicken, then I would suggest pre-cooking the vegetables, at least a little bit. HI I thought the meal prep freeze option. But could you put it in crock pot frozen and let cook for say 10 hours??? Hi, Darla! Yes, I think that would probably work fine! Hi! I am very impressed that you are still replying to comments about your recipe after 2 years! Wow! That is great consideration being given to your patrons. I suggest that you edit your recipe to include a comment about the need to understand that the slow cooking times need to be considerably adjusted for the type of chicken that is used, don’t you think? Here is another suggestion- red pepper flakes! 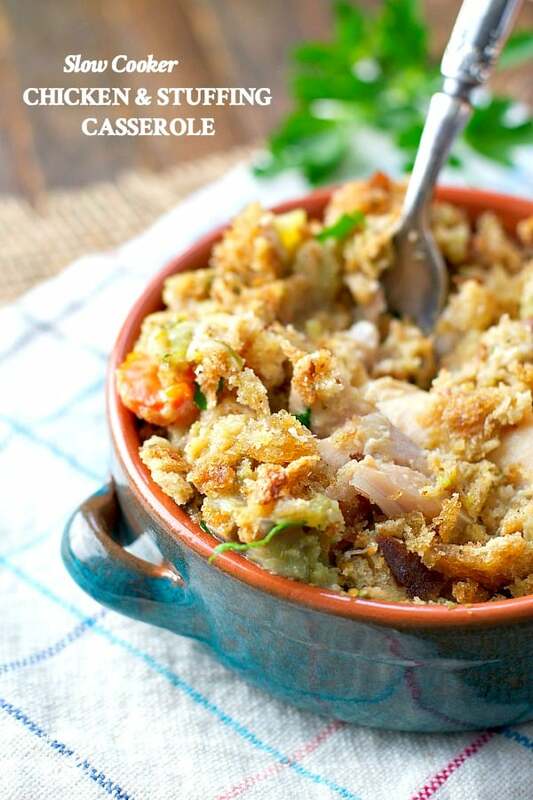 It only takes a pinch, but what a zing it adds to the stuffing mix. Here is my last suggestion- I promise! Try adding slices of fresh mushrooms. I like sauteing the mushrooms in butter first, getting them to brown and removing some water content, then adding them to the slow cooker 15 minutes or so before serving. Ok Ok! One more suggestion, the last one! I promise (again!). Add a garnish. Chop up some fresh Italian parsley, and/or fresh chives, and/or fresh scallions, and/or fresh green and red bell peppers ….. well, you get my drift! The color will add great eye appeal to your recipe, IMO! Thanks for this chance to comment. . . Thanks so much for another delicious recipe. I made it today and just tried it. It was wonderful. I used stovetop because that’s what I had and it worked fine. I also did a can of cream of onion soup because we don’t do mushrooms and I only had one cream of chicken. It gave it a nice tastes. Thanks again. How much is in a serving? Sounds delicious, have it in the crockpot now! Hey, Amanda! The nutrition information assumes 8 servings in the total recipe. So if you divide the finished meal into 8 even servings, that’s the nutrition information that you see. If you only get 4-6 servings out of the recipe, the nutrition facts will obviously change accordingly. Hope that helps!